← Here is the next revolution in records and records management? Monologue vs. dialogue: The myth that governments need more or better communication. There is an on-going myth within social media circles that governments need more and better communication. The problem is that this is not true. Governments spend a large amount of time and money communicating with the public. They have annual reports, they have newsletters, they have Twitter feeds, Facebook accounts, and they have YouTube channels. 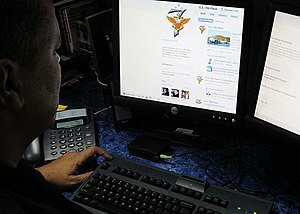 They have minutes, they have agendas, and they have reports all of which are published in paper and electronic copies. Then within each government, the various departments have their own publications, their own media teams, and their own engagement strategies. The issue is not communication nor is it the quality of the communication. The reports are well researched, written, and presented. The message is often consistent and repeated from the political leadership through the senior management down to the frontline services. The staff know their lines, their key messages, and they can explain them. The reports, papers, messages, and communication consistently stress the good news from the organisation’s perspective. Even when policies, projects, or proposals do not work as intended, the communication is couched in good news. Everything I have mentioned above is a monologue. It is the organisation communicating with the public but on the organisations terms and conditions. The public, however, want dialogue. They want to talk to and talk with the people who deliver the services. They do not want to be talked to. They do not want to have the press line or the management line. They want to talk to someone who can answer their questions no matter how far-fetched or obvious. They want to have answers and they want to ask question. They do not want to wait days for a non-response or a response that tells them what they already knew. Social media may yet change the communication culture. Social media is a technological approach that allows such dialogue. However, it is only a technology; it will not change a culture. The culture is not against communication. It is against dialogue that strays away from the monologue. What the public want is someone who can answer their questions. At the same time, they need someone who can tell them what can and cannot be done and, most importantly, why. However, the last part limits communication and dialogue. Why? It is the point where accountability and authority diverge. The people most likely to be given this role are middle managers. It is middle managers do not have the authority but will have the accountability for anything that goes “wrong” in the dialogue. The culture is compounded by risk aversion. Government, local or national, is notoriously risk averse. Deficit thinking and deficit management dominate the view. As a result, any activity, like blogging or social media dialogues, will create a risk. To avoid the risk, the dialogue quickly becomes a monologue where managers repeat the organisation “line”. Consider the following scenario at the opening of Terminal 5 at Heathrow. The opening was not successful and there were a number of problems. Imagine a middle manager explains, in social media, where it will be permanent and easily repeated (unlike face-to-face or telephone), and the reasons why there were delays or a backlog. If that explanation does not match what has been “agreed” and provided in the press briefings, the following is likely to happen. The corporate communication “enforcers” will be on that manager faster than the Aurors in Harry Potter. The aurors will look like girl scouts in comparison. If they are not sacked outright, they will certainly be disciplined. One thing for certain, is that in the future they will not offer a perspective different from what is “agreed”. Organisations, especially large governmental ones, are hierarchical structurally and functionally. Large business firms can move, to some degree, away from hierarchy by devolving authority and responsibility. By contrast, government have dual accountability and dual hierarchies. They have the organisational hierarchy and they have the political hierarchy. The officer or civil servant who consistently flouts the “party line” of the political party in charge in a sustained or consistent way in public will not stay for very long. At the same time, social media will not subvert the hierarchy because the hierarchy sustains the internal structure and its external delivery. To that extent, the hierarchies are networks and competing to control anything that could challenge it. Management fearing loss of control encourages monologues. The final problem is that social media challenges the normal managerial relationship. The technology challenges their control of the situation and their employees. Moreover, there is always an implicit fear, in periods of rapid change, those employees who are “good” at social media may make them look bad or make their role redundant. Why do we need the manager if we can go straight to the employee for the answer? Drucker famously argued that most middle managers could be removed and the social media appears to carry through with that idea. At the same time, control makes sure that good news is reported upwards. Social media can appeared uncontrolled, either internally or externally, with “bad news” emerging to challenge the perceived or accepted view. If social media fixes the bad news, then it will work. However, it is more likely to be seen as something that challenges the entrenched communication system. If the entrenched communication system filters the communications to meet senior politicians or senior management expectations, it will resist. What Chief Executive is going to be happy to read on an internal blog or, worse, an external blog that project XYZ is actually behind schedule? The problem is compounded when all the reporting layers have stressed the good news. Therein, we see why an internal communication culture will want to cut either an internal or an external dialogue. Leaders have to overcome these implicit, or explicit, biases within the culture. If government is to “communicate” better, it has to accept and nurture dialogue. The process has to start inside the organisation. If the dialogue and openness are not occurring in the organisation, it will not happen externally. For this to work, the senior managers and the politicians have to see and understand the benefits. They need to understand the benefit of an internal communication system that can communicate critical information upwards. At the same time, it has to see how the external dialogue can improve the organisational reputation. The dialogue will be based on direct experience and not corporate communication context. For more on this topic see this excellent MA thesis. This entry was posted in information management, innovation, knowledge worker, leadership, local government and tagged Communication, Facebook, leadership, Organization, politics, social media, technology, Twitter, YouTube. Bookmark the permalink. 6 Responses to Monologue vs. dialogue: The myth that governments need more or better communication. Not sure if all that mountain of government communications is all that well presented, to be honest. When was the last time your dad read through a government report? Or a press release? If it’s once within the last five years you are doing really well. However, I do absolutely agree that government – local and national – needs to be so much better at listening and I absolutely love every single syllable of your final paragraph. An organisation really does have to get it internally first before it can really crack external. If it can’t listen to itself what hope has the resident on the Clapham Omnibus got? Thanks for the very positive comment. Yes, i may have over egged the quality issue. I was thinking about some of the material out of parliament or out of USDOD for quality and content as well as some of the analytical stuff from Congress. I have seen some good material from other govs. However, the point is correct is the public reading and appreciating it and better still using it? All are key to the dialogue that is democracy. 1. While I agree that the government doesn’t need more communication, I disagree with the assumption that the government doesn’t need better communication. It does need better communication. Desperately. 2. I’m leery of the assumption that people want to talk to the government. Perhaps this is just a semantic issue, but I would say that people want to be *able* to talk to the government. I’ve seen little evidence that most people want to engage with the government unless they believe that a government process has broken down. Please don’t interpret this as me saying that the government shouldn’t be available to engage directly with citizens. I believe it should, but only as long as citizens are initiating the conversation. 3. I wholeheartedly agree with the issues you articulate regarding the limitations of hierarchical structure, but I don’t think they’re insurmountable. One grand trend we can perceive across all professions is the democratization of labor. It wasn’t long ago that offices employed teams of typists (see Mad Men). No more than 20 years ago, using Excel was a specialized skill. Now such skills are expected of everyone. The Internet affords more radical democratization of labor through collaborative software, and I’m certain that work currently confined to communication experts will gradually be distributed across entire enterprises. That may mean that people at all levels will be able to recommend ideas for messaging or gather feedback about their organization and funnel it to communications experts. This trend will dissolve some of the layers you describe here (indeed it already is) and allow for more emergent management of communications, with information coming from the top down and bottom up. Our thesis at Measured Voice is that because of this democratization of labor, organizations need to develop and maintain a strong, central, and authoritative organizational voice – one that can be used for broadcast yet also has affordances for direct engagement with individuals and affordances for communicating honestly. Very few organizations know how to communicate directly with individuals or honestly, having been able to filter their voice through press releases, PSAs, jargony reports, or the occasional brochure. As far as I can tell, you are in fact arguing for higher quality communication – communication that is responsive and allows for dialog on citizens’ terms. You are right that some organizations will simply be unable to talk about certain issues – particularly agencies that enforce policies that make no rational sense – but many government organizations can develop operations to communicate in the manner you describe. They’ll be forced to, one way or another. Thank you for taking the time to respond with very good comments. You raised a number of points that I will have to consider in more detail. I have responded with the numbering. 1. Agreed. I was focusing on communication as monologue so to the extent it is a dialogue, then it needs to improve. 2. Agreed. I rarely call the Water Company to discuss the future of water management, but I am on the phone pretty quick if there is a broken pipe.  However, governments are also proactive, ie proposing policies and suggesting programmes that need to dialogue with the public. Often these involve choices or tradeoffs that need to be explained. We then return to broken pipe issue. At the sametime people perceive an issue, ie what is reported so they may query it to clarify, which is not the same as a broken pipe nor is it programme engagement/development work. At the same time, the challenge to middle management, the area that has to make sense of the developments is increasing. The communications systems within organisations are changing. However, as above, it is not evenly distributed. (See my post on middle managers as sense makers). The trend is as you suggest, it depends on the culture of each organisation, reflecting its business and its leadership, as to how fast or slow it is being adopted and adapted. I will have to check out Measured Voice. It sounds like a good idea and working in the right direction. I agree about the enforcement agencies, this is perhaps where communication is most important because it diffuses a lot of secondary issues if one can explain it beyond “We said so”. (A huge simplification but often the argument from authority is the final argument in many of these situations.) The trend in general is positive. What remains to be seen, and I hope your work experience, with Measured Voice, is that governments are reflecting these trends and taking them up rather than avoiding them or resisting them. Thanks again for an excellent set of comments.